Local Motorcycle ET Bracket Racing Can It Be Saved? The article is dedicated to its late author Aaron Green. For the last several years around North America it has been pretty obvious that local motorcycle ET bracket racing has been in a state of decline. Having been around ET bracket racing with bikes and cars for many years, I have to ask, why? After all, racing a motorcycle is exciting. Back in the early 1980’s in my home State of Florida, motorcycle ET bracket racing was very popular. Some races would draw as many as 40 to 70 bikes for a local Friday or Saturday night event. That was in the days before delay boxes, and safety rules were not as strict as they are today. Now I am not saying that we should go back to the old ways of pretty much “anything goes” safety wise, anyone racing a bike should have a proper full face helmet, gloves, leathers, and boots. That is just common sense. I am a firm believer in safety, and I wear a top of the line helmet, boots, gloves, leather jacket, etc., when I ride my own street bikes. Fact is bike counts have dropped off at most tracks to where racers now often run for a “percentage” based purse off the number of entries, and some tracks have just stopped running ET bracket bikes period. So, what is “the problem?” I do believe there is “something” that has caused “the problem”, and the steady decline I have witnessed in local motorcycle ET bracket racing over the years. That “something” is drag racing electronics, like delay boxes, automatic shifters, and throttle stops. That and purpose built, towed in drag bikes, with racing tires, and wheelie bars that can run the number like clockwork running against street bikes. What are the odds of the street bike beating a purpose built drag bike in an ET race? Here in Florida, for the last several years, racers like husband and wife team Roy and Candy Hagadorn, and Dennis Stewart, among others, seem to be able to win pretty much at will most of the time. The racers named all run delay boxes, racing tires, automatic shifters, and wheelie bars with towed in purpose built drag bikes. Now please don’t get the idea that I am picking on Roy, Candy, or Dennis, because I am not. They are all nice people that are very skilled racers, and they all have years of experience in their corner. The thing is racers like them are so good that the average Joe off the street, that tries to have some fun and race his street bike at the track against racers of that caliber, is going to get thumped 99 out of 100 tries, odds are. The end result is, after a few first round loses, the average Joe who might have become a regular motorcycle ET racer at his local track thinks “this is no fun”, and will just go hang out at the local bike night instead, or maybe take up bowling or something, and the local track loses potential revenue. Back in the early 1980’s I remember one race I announced at the 1/8th mile drag strip over in Saint Petersburg, Florida on a Friday night that had a total of 77 entries in ET motorcycle. This was a regular Friday night race, not a special event, in the pre-drag racing electronics days. The only times I have ever witnessed a larger field of ET bikes in competition at one event has been at AHDRA or AMA/Prostar national races. Both organizations have some races for ET bikes each year with over 100 entries, but then again they are major national races, not just a local deal. So, I would imagine someone reading this would now be thinking, “OK Green, you stated “the problem”, so what is “the solution” to making local ET bracket bike races bigger again?” Well, that is a fair question, and I do have an answer that I think would work at most tracks in North America. The answer? Street bikes. Fact is any motorcycle that rides by the front gate of any race track, any given day of the week, is a potential motorcycle ET racer. Most drag strips are missing the boat. Track operators just need to create a place for them to race. Now when I say “a place to race”, I mean a deal where the average Joe who is a new racer does not have to worry about being the “guppy” that gets eaten up by the “sharks” right out of the box first round. 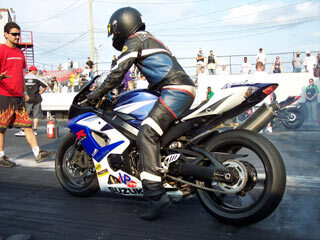 Tracks should create and promote street legal motorcycle ET bracket racing. What is in it for the tracks? More revenue, which should interest most track operators. Most track operators I know like making money. Fact is motorcycles and motorcycling are more popular today than they have ever been. The popularity of Harley-Davidsons just seems to keep growing and growing, as it has for a couple of decades now. Plus, modern import Sportbikes are more popular than ever too. There is nothing wrong with having a separate class for import Sportbikes, and a separate class for V-Twins. The street bike classes should require a street legal bike with DOT tires, no wheelie bars, and definitely no drag racing electronics. Meaning no delay boxes, no throttle stops, no automatic shifters, etc., just to allow the average Joe with a street legal bike a level playing field, and a shot at winning some rounds. The purses would not have to be “for all the money in the World”, entry fee’s and payout should be kept on the low side to encourage people to come on out and give it a try for a reasonable price. Maybe get a local motorcycle shop to sponsor trophies for the winner, or even sponsor the class or classes outright. Perhaps some people will enjoy the street bike racing enough in a program like that to where they would eventually move on to running a purpose built drag bike. I am not saying can a purpose built drag bike class, I am saying don’t make street legal bikes run against purpose built drag bikes. From experience in being involved in promoting automotive and motorcycle events at race tracks in the past, I can tell you for a fact that local motorcycle dealers are some of the easiest people to deal with when seeking sponsor support for a program at a local race track. Most dealers do have access to co-op money with the motorcycle manufacturers, and the ones I have dealt with were almost always happy to support some local motorcycle promotion at a drag strip. Those are just my ideas on how to grow local motorcycle ET bracket racing. The grass roots “little guy” racer is the roots of the sport, without them, we have nothing. If you have any brilliant ideas on the subject, please contact me and let me know. Lets see if some race track operator reads this and decides to “run with the ball”. After all, motorcycle drag racing is a lot more exciting than bowling. Thanks for reading and race safe. i agree with you 100 percent. tracks like ours have two classes sled/bike and street bike i agree that the street bike class shouldnt alow any electronics. we are lucky to get 20 bikes but i also think that lack of prize money keeps some away. its 25. to enter, a trophy to win.